According to Afoot and Afield in Los Angeles County, there is a trail up Warm Springs Mountain. It doesn't actually get to the top, but it gets close enough to scramble the rest of the way. According to the forest map, there is a trail up Warm Springs Mountain. It even has "OHV" written on it at the top, though that may be due to whatever road at the saddle Afoot and Afield mentioned should be ignored. The directions seem less complete than usual in the book, but they did seem to hit all the points in getting me there. It says the trail is unsigned at marker 11.23. Unfortunately, the roads in the area have been remeasured. I already found this on the other trail I tried, so wasn't too worried that 11.23 a fully unmarked wall and there wasn't any ravine for the trail to go up from 10.98 or so (where I was parked) to 11.29. That first one was a very tight ravine and very soon after was another, but the other showed no evidence of a trail while the first had a trail up along one side, but no beginning. Once I decided that had to be the one, I could see where people had scrambled into it. Some people scrambled down into the bottom and some people went up and scrambled their way along the loose rocks, often directly up. Eventually directly up started to seem ridiculous and I saw a little bit of people going down into the bottom of the ravine anyway. It looked much easier to do there, too. I dropped into the ravine and from there didn't know what to do. I was already deciding to turn back instead of try this ridiculous route. However, I didn't much like the idea of scrambling down all the stuff I'd come up. I walked just a few yards down the ravine and spotted what looked like a much better trail on the other side of it. From the entrance, it hadn't looked like there could be a trail on that side. 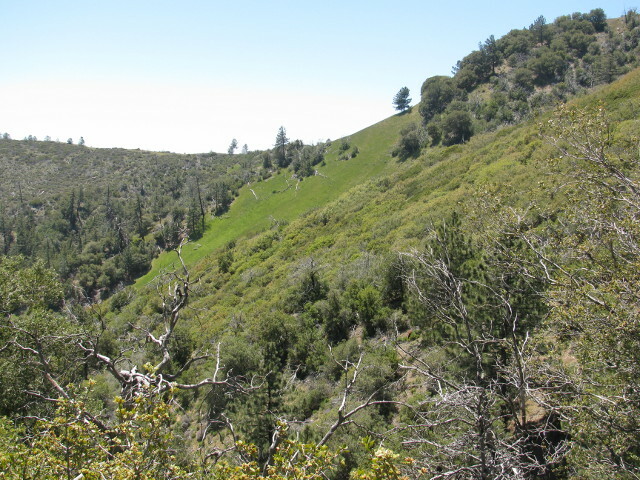 The ravine had lush areas and desert like areas feet from each other. 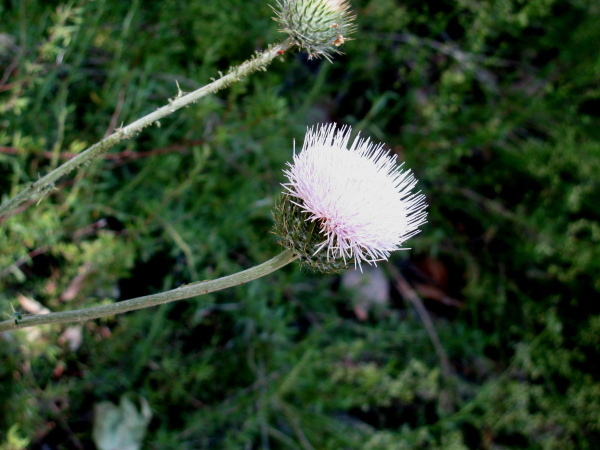 A bunch of thistles were down in the flat at the bottom of this rarely flat ravine. 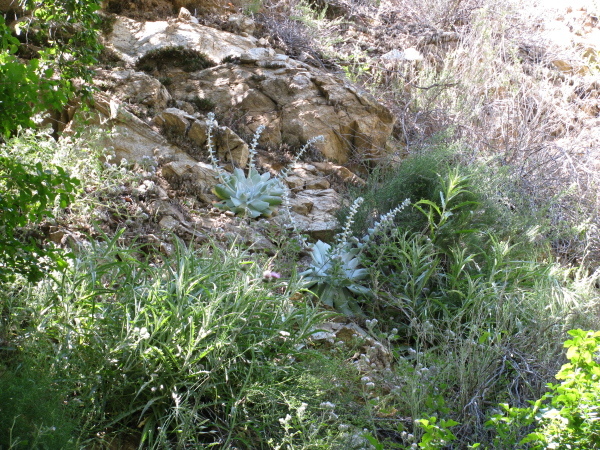 Figueroa Mountain is a favorite spot for viewing wildflowers for the general public. There are a few places where the displays are considered more impressive, but they are very few and further away. Also, for some, this is a favorite drive, getting high up the mountain before dropping down the other side. My mother and I made the drive for my birthday and, of course, to see the wild flowers. Very near the top of the mountain, a steep hillside appears to be a lot of grass rather than flowers. Our first stop was by the side of the road nearing the top of the mountain. Here there was all sorts of lupin reaching high into the sky. The lupin had quite a number of ladybugs wandering their stems in search of aphids. 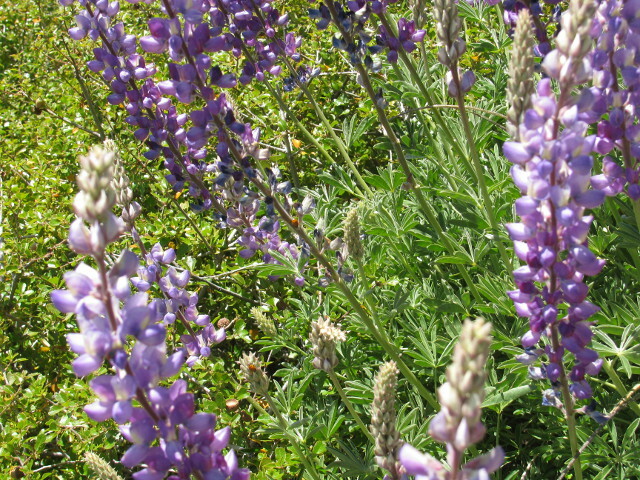 A bunch of lupin stalks and a couple lady bugs patrolling them for their favorite prey.